Inspired by nature. Hand finished on the Emerald Coast of Florida. Designs are burned / carved into wood using a protected & secret process. These pieces are built with Heavy Duty Stainless Steel and White Oak. The Double Hinged Cork Pull allows a 2-step opening process that gets the cork out every time. 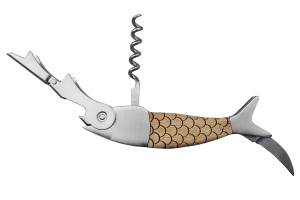 Includes Bottle Opener, Cork Screw, and Foil/Line cutter.